Capital of Karnataka state, Bangalore, also known as the 'City of Gardens', is one of the most attractive cities in India with its beautiful parks, avenues and impressive buildings. Aquarium (Timings: 1000 to 1930 hrs., closed on Mon. and second Tues. of the month Entry Fee: Rs.2/- Adult & Re.1/-child) ; Bull Temple; Cubbon Park ; Fort & Tipu Sultan's Palace ; The Jawaharlal Nehru Planetarium ; Lalbagh / Botanical Gardens ; Sankey Tank (9 Km.) ; Ulsoor Lake (0900 to 1800 hrs., closed on Wed.) ; Vidhana Soudha ; Govt. Museum & Venkatappa Art Gallery ; Visveswaraya Industrial & Technological Museum. Kanva Reservoir (69 Km. ): A popular picnic spot. Kaivara (79 Km.) : Kaivara is a religious centre, known for it's temples dedicated to the Pandavas, heroes of the epic 'Mahabharata'. Kolar Gold Fields (98 Km. ): The deepest working Gold mine in the world is located here. Prior permission is necessary for visiting the mines. Mekedatu (98 Km. ): On the Kanakapura Road, it is a quiet place to go for a day's outing. At Sangama, where the rivers Cauvery and Arkavati meet, there is a Sangameswara Temple. Area : 272.12 Sq.Km. Altitude : 920 Metres. Temperature : Summer Max: 35 Deg.C. Min: 20 Deg.C. Winter Max: 28 Deg.C. Min: 14 Deg.C. Rainfall : 86 Cm. (June-Oct). Season : Throughout the year. (Sept. to Mar. is the best time to visit). Air : Indian Airlines and private airlines connect Bangalore with important cities. Rail : Bangalore is well connected by rail with major cities in India. Tirupati 250 Km. and Yercaud 228 Km. Bangalore City Tour: Covers Vidhana Soudha, Lal Bagh, Bull Temple, Tipu's Palace, Museum, Cauvery Handicrafts Emporium and Ulsoor Lake. Timings: 0730 -1330 hrs. & 1400-1930 hrs. (Daily). Fare: Rs. 80/-. Mysore Tour: Covers Srirangapatna, Mysore Palace & Zoo, Art Gallery, Chamundi Hills, Brindavan Gardens, St. Philomena's Church, Daria Daulat, Gumbaz, Ranganathaswamy Temple and Cauvery Handicraft Emporium. Timings: 0715 -2300 hrs. (Daily). Fare: Rs. 240/- & Rs. 325/- (A/c.). Belur, Halebid and Sravanabelagola: Timings: 0715 -2200 hrs. (Daily). Fare: Rs. 340/-. Tirupati Tour, Timings: 2200 hrs.to 2100 hrs. (next day).Fare:Rs. 450/-(Inclusive of Darshan). KSTDC also conducts tours to Mantralaya, T.B. Dam & Hampi (Every Friday, 3 days tour, Fare: Rs.850/-); South Canara (5 days tour, Dep: every Thursday, Fare: Rs. 1185/-) and during season to North Karnataka, Jog Falls, Nagarhole & Mercara-Nisargadham, etc. 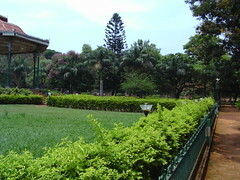 Bangalore City Tour: Timings: 0900-1700 hrs. Fare:Rs. 105/-(Excludes Entry Fee). Mysore Tour: Timings: 0715 –2315 hrs. Daily. Fare: Rs. 260/- (Excludes Entry Fee). Sankey Rd.,Tel: 2269898. Fax: 2264941. Airport Road, Tel: 5564525. Fax: 5212323. M.G. Road,Tel: 5585858. Fax: 5585960. Race Course Road, Tel: 2255055. Fax: 2200010. High Grounds,Tel: 2269462. fax: 2250033. 28, Sankey Road, Tel: 2262233. Fax: 2262050. M.G. Road, Tel: 5584444. Fax: 5584748. Residency Road, Tel: 5584545. Fax: 5584030. O.T.C. Road, Tel: 2224470. Fax: 2224424. M.G. Road, Tel: 5594666. Fax: 5594029. St. Mark's Road,Tel: 2279090. Fax: 225700. Hotel Abhishek, Kumara Krupa Road, Tel: 2262713, Fax: 2268953 (Tariff: Sgl. Rs. 990-11065 & Dbl. Rs. 1080-1230/-); Hotel Broadway Complex, K.G. Road, Tel: 2872321, Fax: 2203661 (Tariff: Sgl. 400-650/- & Dbl. Rs. 500-800/-); Harsha Park Inn International, Park Road, Tel: 2865566, Fax: 2865943 (Tariff: Rs. 1800-2000/- & Dbl. Rs.2000-2200/-); Hotel Geo, Near Corporation Circle, Tel: 2221583, Fax: 2221993 (Tariff: Rs. 600-750 & Dbl. Rs. 750-950/-); Hotel Indraprastha, Gandhinagar, Tel: 2202622, Fax: 2265063 (Tariff: Dgl. Rs. 700-1150/-); Hotel Ramanashree, R.R. Mohan Roy Road, Tel: 2225152, Fax: 2221214 (Tariff: Sgl. Rs. 1895-2395/- & Dbl. Rs. 2295-3295/-); Kamat Yatrinivas, Gandhinagar, Tel: 2260088, Fax: 2281070 (Tariff: Sgl. Rs. 700-800/- & Dbl. 900-1050/-); Nalapad's Hotel Broadway Annexe, K.G. Road, Tel: 2266374, Fax: 2872321 (Tariff: Sgl. Rs. 500-650/- & Dbl. Rs. 650-850/-); Nilgiris Nest, Brigade Road, Tel: 5588401-4, Fax: 5582853 (Tariff: Sgl. Rs. 970-1300/- & Dbl. Rs. 1200-1700/-). Ashraya, Infantry Road, Tel: 2261921, Fax: 2263982 (Tariff: Sgl. Rs. 1150/- & Dbl. Rs. 1350/-); The Atria Hotel, Palace Road, Tel: 2205205, Fax: 2256850 (Tariff: Dbl. Rs. 2200); Ballal Residency, Residency Road, Tel: 5597277, Fax: 5597276; Berrys Hotel, Church Street, Tel: 5587211, Fax: 5586931 (Tariff: Sgl. Rs. 600/- & Dbl. Rs. 700/-); The Basil, Malleswaram, Tel: 3315123, Fax: 3343904 (Tariff: Sgl. Rs. 850-1200/- & Dbl. Rs. 1050-1350/-); Bombay Ananda Bhavan Hotel, Vittal Mallya Road, Tel: 2214581, Fax: 2277705 (Tariff: Rs. 350/- & Dbl. Rs. 750/-); The Capitol, Rajbhavan Road, Tel: 2281234, Fax: 2259911 (Tariff: Sgl. Rs. 2260 & Dbl. Rs. 2800/-); Comfort Inn Infantry Court, Infantry Road, Tel: 5592281, Fax: 5592276 (Tariff: Sgl. Rs. 2000/- & Dbl. Rs. 2250/-); Comfort Inn Vijay Residency, Gandhinagar, Tel: 2203024, Fax: 2281064 (Tariff: Sgl. Rs. 1300/- & Dbl. Rs. 1600/-); Curzon Court, Brigade Road, Tel: 5581698, Fax: 5582278 (Tariff: Sgl. Rs. 800-1200/- & Dbl. Rs. 1000-1400/-); Hotel High Gates, Church Street, Tel: 5597172, Fax: 5597799 (Tariff: Sgl. Rs. 1600/- & Dbl. Rs. 2000/-); Hotel Ivory Tower, Barton Centre, M.G. Road, Tel: 5589333, Fax: 5588697 (Tariff: Suite Rs. 1600/-); Hotel Mahaveer, Near City Railway Stn., Tel: 2873670, Fax: 2870735 (Tariff: Rs. 285-750/-); Hotel Mayura, Gandhi Nagar, Tel: 2254111, Fax: 2256685 (Tariff: Dbl. Rs. 950-1575/-); New Victoria Hotel, Residency Road, Tel : 5584076-7, Fax: 5584945; Hotel Rajatha, O.T.C. Road, Tel: 2281056 (Tariff: Sgl. Rs.395-800/- & Dbl. Rs. 500-800/-); Hotel Rajputana, Hospital Road, Tel: 2876897, Fax: 2877121 (Tariff: Sgl. Rs. 450-600/- & Dbl. Rs. 550-700/-); Hotel Rama, Lavelle Road, Tel: 2273311-14, Fax: 2214857 (Tariff: Sgl. Rs. 1599/- & Dbl. Rs. 1799/-); The Richmond Hotel, Richmond Road, Tel: 2233666, Fax: 2233777 (Tariff: Sgl. Rs. 1600/- & Dbl. Rs. 1800/-); Royal Orchid Park Plaza, Golf Avenue, Airport Road, Tel: 5205566, Fax: 5216247 (Tariff: Sgl. Rs. 2990-3490/- & Dbl. Rs. 3490-3990/-); Hotel Shalimar, B.V.K. Iyengar Road, Tel: 2258063 (Tariff: Sgl. Rs. 295-420/- & Dbl. Rs. 395-545/-); Hotel Swagat, Hospital Road, Tel: 2877200, Fax: 2259837 (Tariff: Dbl. Rs. 600-900/-). II. Tariff of the following hotels ranges from Rs.400/- to Rs.1000/- for a single room and from Rs.800/- to Rs.1500/- for a double room. Airlines Hotel, Madras Bank Road, Tel:2271602; Hotel Ajanta, M.G. Road, Tel: 5584321, ; Hotel Bangalore Intern'l, High Grounds,Tel: 2268011; Hotel Cauvery Continental, Cunningham Road, Tel: 2256966-9; Hotel Chalukya, Race Course Road, Tel: 2265055; Hotel Hoysala, Sheshadripuram, Tel: 3445311; Hotel Kanishka, II Main Road, Gandhinagar, Tel: 2265544; Hotel Mayura, Race Course Road, Tel: 2254111; Hotel Shalimar,Tel: 2258016; Hotel Swagath, Tel: 2870007; Woodlands Hotel Pvt. Ltd., R.R. Mohan Roy Road, Tel: 2225111.